Having tested no fewer than 17 flat pedals in last year’s epic group test, David Hayward has developed a keen eye (or is that foot?) for detail when it comes to assessing a flat pedal’s feel and performance. 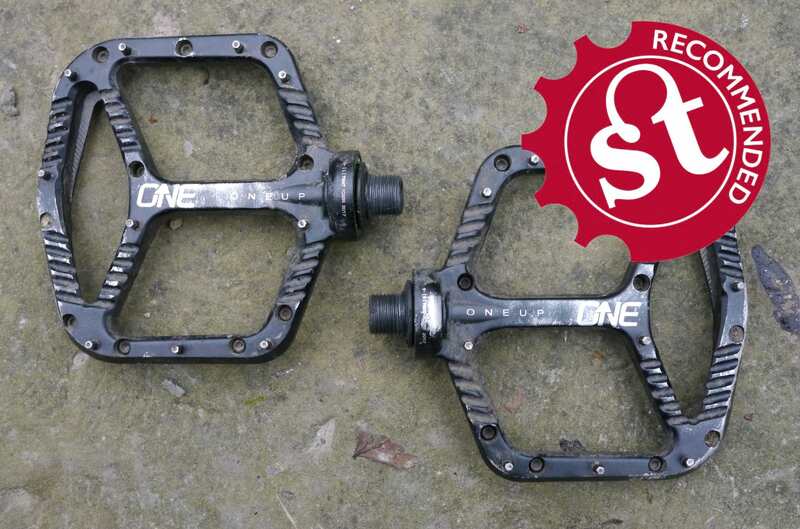 So when OneUp Components decided to enter a crowded arena with its very first flat pedals, we figured there was one man for the job. Take it away David! 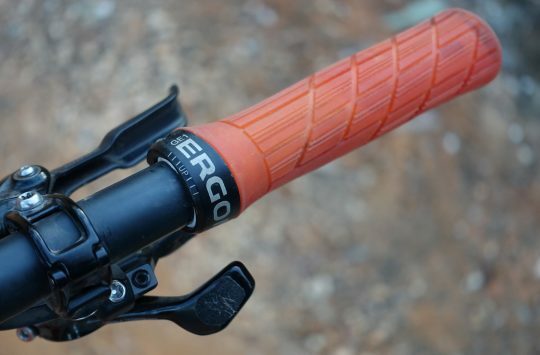 When it comes to bike bits, a lot of design problems have basically been solved. Many things are simply good enough, and any flaws small enough to live with. Nonetheless, even the most amply resourced companies can mess up on design, putting out revision after revision until they get it right. If the same thing happens to smaller companies, it can take years to untarnish their reputation. 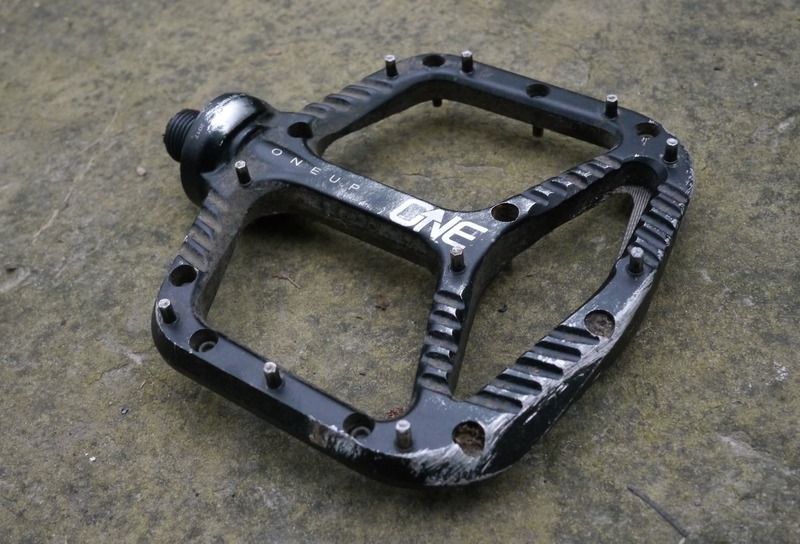 So, looking at some brand spanking, ludicrously thin pedals from a relatively small company that seems to be rapidly expanding its product lines, and hasn’t made pedals before, these flat pedals from OneUp seemed ambitious. I was prepared for the worst. It never happened. 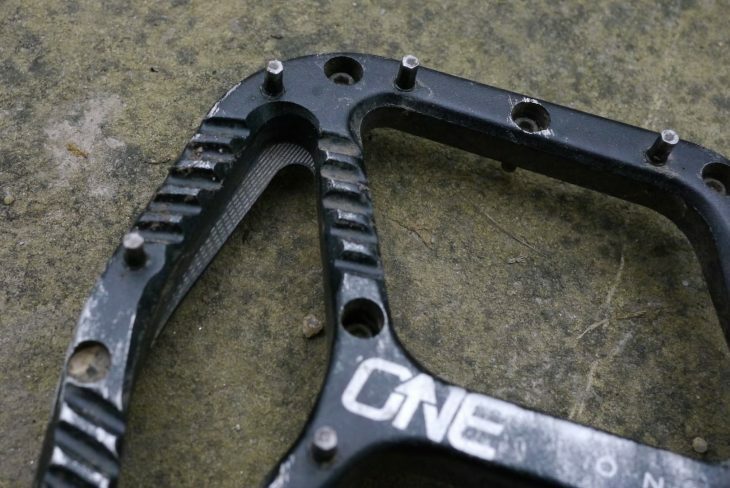 OneUp Components has jumped into the flat pedal market with two options – this is the alloy version. 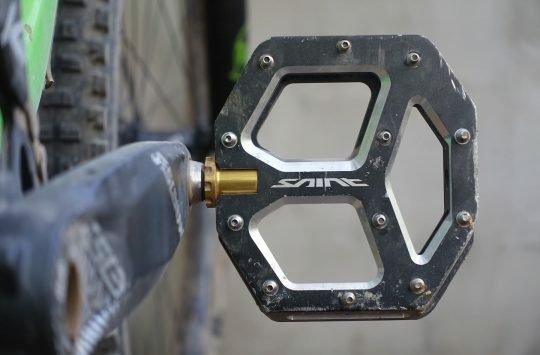 These have no fancy model name, and are simply “OneUp Aluminium Pedals”. The bodies are extremely thin, with 8.3mm leading edges and a few striped patterns criss-crossing them. There are twenty pins per pedal, and a large bearing bulge that sits beside the crank. That bulge is far from unique to these pedals, and tends to be a make or break thing for many riders: either you mind it, or you don’t, and I’m firmly in the latter camp. As with many pedals that have large inboard bearings, if your bike is wearing crank boots, you might need some pedal washers to get enough clearance. Measuring just 8mm at the leading edge, these are very thin pedals. The leading edge, minuscule though it is, still has a slope to deflect rocks. The overall platform size is large, but not too large for my UK 9.5 feet. OneUp also does a composite plastic version with a similar body shape, with an identical (claimed) weight of 355g. The main differences between those and these aluminium ones is the thickness, increased by around 6mm all over the plastic pedal, and the price, with the composite ones costing less than half the price of this alloy pair. The pins are a through-pin, socket-cap design, making extraction very easy should you bust one. I didn’t manage to, despite some hearty rock strikes and the odd scrape while riding tired. The pins have hexagonal tips, giving them some corners to theoretically bite into your shoe. While I am fairly sensitive to bike setup and characteristics, I don’t quite have the princess-and-pea sensitivity to say “Yes, yes, these are definitely better than otherwise identical pins with circular tips”; perhaps you do though. You’ll find 10 vicious-looking pins per side. The pins thread in from the backside. 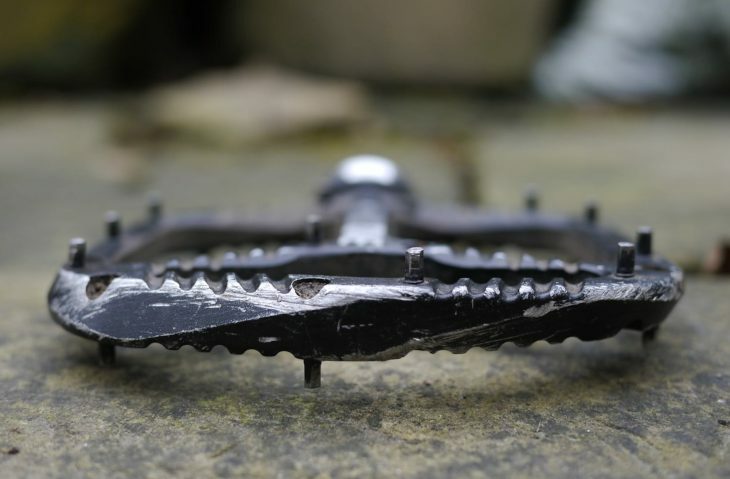 Internally, they run on one large inboard bearing, and three small outboard ones stacked together on the end of the axle, as is the standard for such thin pedals. While some other manufacturers experimented with just two tiny bearings on early versions of their own ultra-thin pedals, you need three to get the required longevity. It’s good to see OneUp getting this right from the start. The majority of pedals are simple to service, and these are no exception, with some nice features designed in. To open them up, as well as allen keys and maybe pliers, you simply need a cassette lockring tool. After first pulling a seal, the cassette tool goes on over the threaded end of the axle, then extracts a locknut from on top of the biggest bearing. The splines are shallow, so it takes a little care. The locknut is what holds everything together, so once it’s out, the axle slides out with all of the bearings on. Another retaining bolt on the tip releases the smaller bearings. A cassette lockring tool will help you pull these apart for servicing. I didn’t have to replace or regrease anything during the test, and the pedals are still spinning fine eight months on. 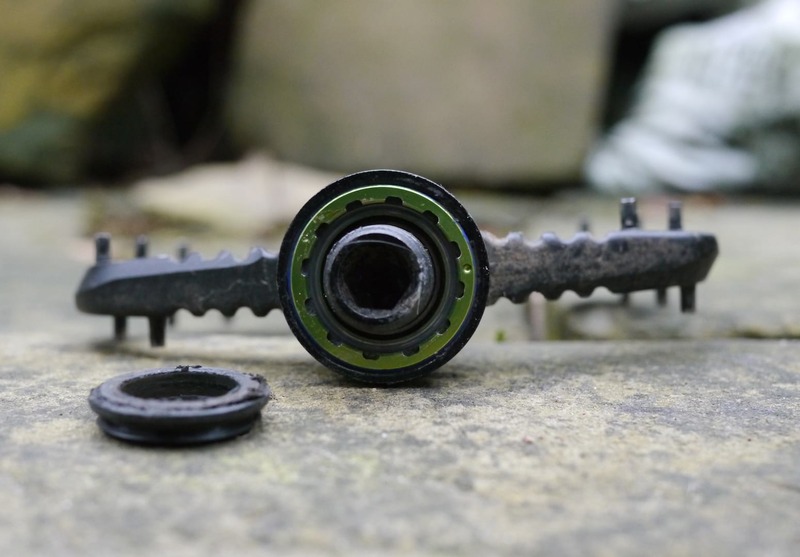 This never fails to surprise me when putting small bearings through filthy Yorkshire conditions. The big seal at the crank end, coupled with no opening at the outer end of the body, seems to have kept all the muck and grit out for now. As well as that, dings and crashes haven’t bent the cromo axles, or put any significant dents in the bodies. Apart from surface wear and gouges, the pedals are still in great shape. 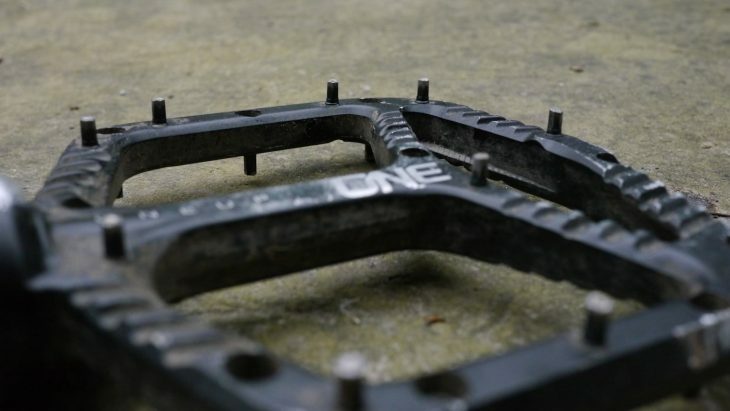 David gives the OneUp flat pedals a Singletrack Recommended award. Grip is extremely good, and much better than I’d expect for such a flat body profile. If you absolutely demand a foot sucking bowl shape from your flatties, these might not be the ones for you, but the combination of tall plus centre pins has made them more than grippy enough for me in all kinds of terrain. After six months of getting wailed on by my awful feet and worse technique, these are still going strong, and are one of my go to sets of pedals. 355g puts them in a respectable weight range, and for the money you won’t find many significantly lighter. Tough, thin, grippy, light – recommended. 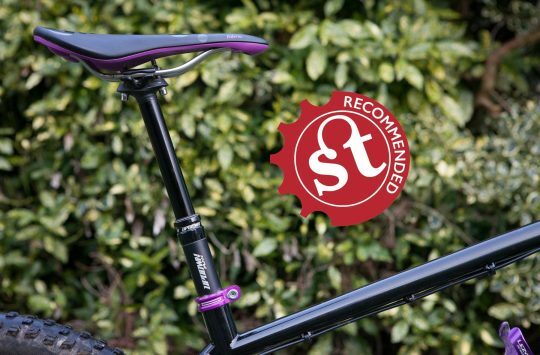 ST Recommended | The Funn UpDown dropper post only lets you down when you want it to! I have had the plastic versions for about ten months and really rate them. Cheap, tough and light. Could be my imagination, but they seem more forgiving of rock strikes than metal pedals. They look very much like the raceface atlas, I believe they might even have been designed by the same chap. Hope the bearings are better than the reacface ones though, they’re utter shite. Trying to decide on new pedals. Which would you have, these One Up Components, crankbrothers Stamp or DMR Vaults? @snowfruit depends what kind of riding you do! All three of those have different characters. Vaults have that bowl shape a lot of riders love, the other two are very flat flats. These OneUps are grippier than the Stamps, but if you’re trying out a lot of tricks and intending to bail, maximum grip might not be everything to you!